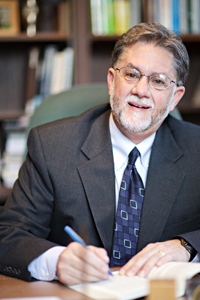 EDITOR’S NOTE: In what follows, Bruce A. Ware, professor of Christian theology at Southern Seminary, dis- cusses his new book, The Man Jesus Christ: Theological Reflections on the Humanity of Christ (Crossway 2013), with contributor Josh Hayes. JH: How does a biblical understanding of Christ’s humanity shape our understanding of the Christian life and what it means to be human? Bruce Ware: I grew up in a committed Christian home, and I recall as a young boy (perhaps 12 years old), reading 1 Peter 2:21, where we are commanded to “follow in his steps” and thinking, “How can this be fair?” After all, I had learned that Jesus was God, and it seemed to me that since I certainly was not God, I could not rightly be called to live like Jesus lived. This changes when we see that Jesus lived his life as one of us — as a full and complete human — and carried out his obedience with the same resources now given to us. Jesus knew and relied on the Word of God, prayer and, very importantly, the Holy Spirit who indwelt him. If Jesus lived his life as a man, in the power of the Spirit, believing the Word and praying to the Father — these are all things that we, too, have as Christian men and women. Therefore, it is right to call us to “follow in his steps,” and we can rightly look at Jesus as an example for how we should live (cf. Phil 2:5). JH: If, as you argue in the book, Christ normatively performed miracles and healings through the power of the Holy Spirit, then how do his actions demonstrate his deity? BW: Some miracles of Jesus may indeed give direct support to his deity; I would never want to rule this out. But it looks like the evidence points to the norm being this: Jesus performed his miracles, and cast out demons, as a man in the power of the Spirit. But even here this can support his deity, and here’s how: Jesus made clear claims of being God (e.g., John 8:58; 10:30), and then Jesus said that if you don’t believe the words he says, believe on account of the works that he does, that he is from the Father (e.g., John 10:25, 38). So, the miracles that Jesus does in the power of the Spirit confirm that he is the Messiah of God, so when he claims to be God, we should believe those claims of deity. JH: How does Christ’s humanity relate to his resurrection and reign as the — to use the terminology in your book — “exalted Son”? BW: As the eternal Son of the Father, the second person of the Trinity, he created the heavens and earth and so has full rights of authority over all that he made by virtue of being Creator of all that is. But when this eternal Son came to earth, he was conceived and born as the God-man, the Messiah from God, the greater Son of David. As the Messiah, he did not have intrinsic authority over all, but he had to win the right to rule by obeying the Father and going to the cross whereby he would then be given this authority over all. Many passages of Scripture indicate this. One that illustrates it is this: after his resurrection, in giving his Great Commission directives to his disciples, Jesus begins by saying, “All authority in heaven and earth has been given to me” (Matt 28:18). By his obedient life, substitutionary death and victorious resurrection, he now was given authority from the Father to reign over all (cf. 1 Cor 15:20-28; Eph 1:20-23; Heb 1:1-2).